There are some basic questions that travellers in a camper may have for their first voyage of discovery. Where is it permitted to overnight? A distinction is made between campsites, pitches and free overnight stays. There are over 400 campgrounds across Switzerland. They are among the most beautiful in Europe and are often situated on lakeshores and riversides. Campgrounds offer electricity to the campsite, sani-stations, washrooms and often showers. Well-appointed campgrounds may also have laundry facilities, a small grocery store, restaurant, children’s playground, swimming pool, and sauna. TCS Camping is the largest campground operator in Switzerland. Their campgrounds are renowned for offering excellent facilities. Is it necessary to reserve campsites? We recommend reservations only for those who want to stay several nights in the high season at a site in a particular campground. Most travellers in a compact camper prefer to spontaneously make plans along the way to follow the good weather. 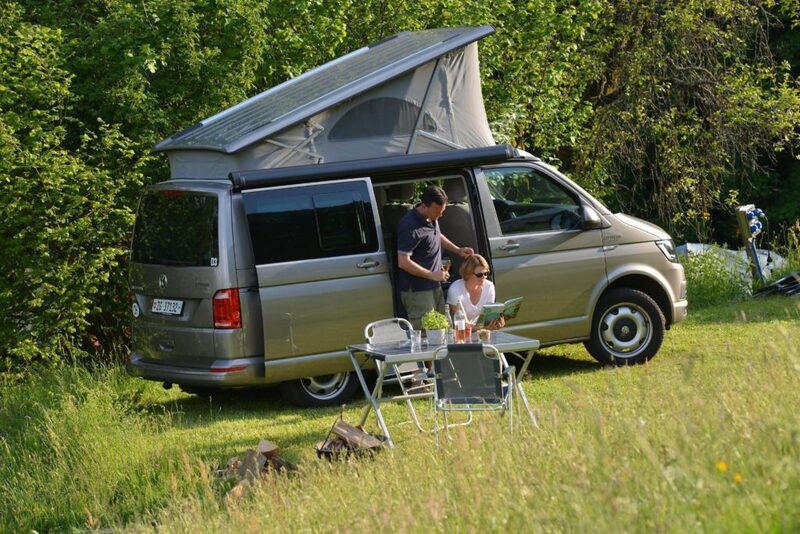 It is much easier to find campsites that can accommodate the compact dimensions of the VW California or Mercedes Marco Polo campers. Those who like camping closer to nature may opt to stay in unserviced areas of the campground without designated campsites. Pitches are usually maintained by municipalities and are intended to provide safe rest areas for weary drivers. Often they do not offer sanitary facilities or running water. There is normally no fee for staying or occasionally a small fee payable at a pay station. Pitches can be useful when only sleep is required during long drives. We recommend staying at campgrounds to realize the best camping experience. No general regulation exists regarding camping in the wild though it is generally not forbidden in Switzerland. Regulations are usually applied by municipalities and less often by cantons. We recommend checking first with local authorities, tourist offices, or landowners directly when there is no information available at the location. Data for locating all campgrounds in Europe and Switzerland are loaded into the navigation devices in our CITYPEAK CAMPERS. Thus it is possible to select a campground according to star classification and be directed there by the vehicle’s navigation system. All CITYPEAK CAMPERS customers are provided with a TCS Camping Guide. This is a great resource for information about campgrounds in Switzerland and the surrounding countries.